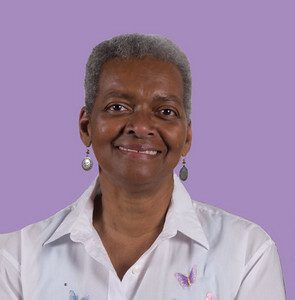 Sharon Sorrels Sharon raised two sons and pursued careers in the arts and education in Washington, DC. She earned a BFA in Design with minors in Art History and Education receiving instruction from renowned artists Lois Mailou Jones and David Driskell at Howard University leading to positions at the National Gallery of Art and the National Endowment for the Arts. Later, a Masters Degree in Library Science led to a rewarding career with the DC Public Schools. Sharon and her husband, Anthony, recently moved to South Carolina, enjoying the beauty and cultural significance of the coastal area. 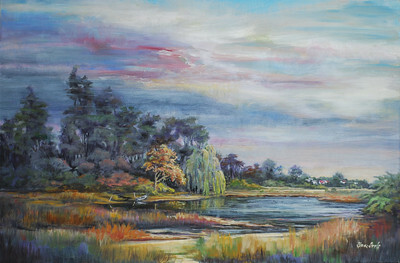 Sharon is a member of the Waccamaw Arts and Crafts Guild and the Seacoast Artists Guild. 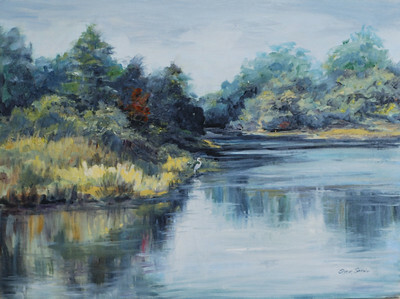 She has enjoyed classes/workshops led by talented local artists and has participated in exhibitions and juried shows where she has been honored as featured artist and received various awards, including Best In Show. “I never tire of exploring and photographing the rural and low country landscape, people, towns, rivers, and beaches, and historical and cultural sites of this beautiful area. Most of the paintings I have completed recently illustrate these experiences. 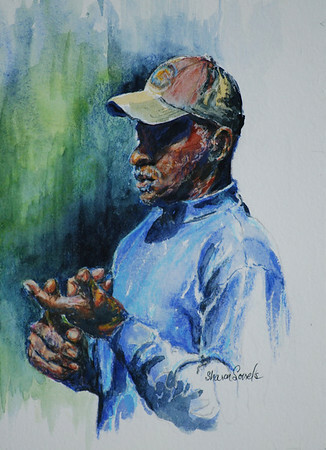 I love to use color (warm and cool), light and expressive brush strokes in landscapes, figurative paintings, and portraits. 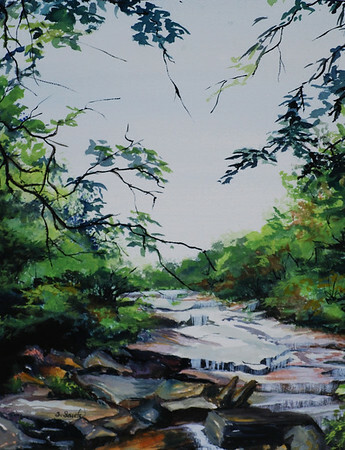 A few landscapes are abstractions, but most are paintings of actual places often featuring pathways, roads, and meandering waterways intended to pull the viewer into the scene. Giclees (quality reproductions) and note cards are available for most of the paintings (whether the original is sold or still available). Please inquire. Needless to say, I love to paint! And lately I have been exploring other creative activities and media as well, including block printing, pastels, colored pencil, and jewelry making.” …Sharon Sorrels Sharon's paintings can be seen at these galleries: Seacoast Artist Guild Mall Gallery, Inlet Square Mall, Murrells Inlet, SC The Art Barn at Blue Moon Nursery, Murrell’s Inlet, SC Georgetown Art Gallery, Georgetown, SC. 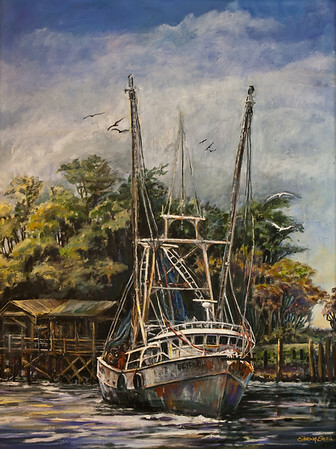 www.georgetownartgallery-sc.com Island Art Gallery, Pawleys Island, SC www.pawleysislandart.com Mercy Care Art Gallery, Myrtle Beach, SC. 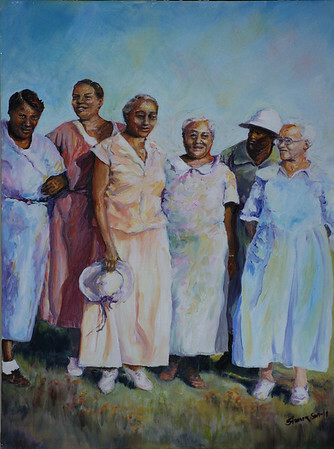 www.mercycareart.com Renaissance Art Gallery, Myrtle Beach, SC Seacoast Artist Guild Gallery at Applewood Restaurant, Litchfield, SC To see more of Sharon's art or to make a purchase, go to www.sharonsorrels.com. Contact Sharon at sorrelssf@usa.net for more information about her work. Name: Watchful Medium: Oil on Canvas Size: 25 3/4 x 32 Contact: Sharon Sorrels E-Mail: sorrelssf@usa.net To see more of Sharon's art or to make a purchase, go to www.sharonsorrels.com. Name: PauWau Fancy Dancer II Medium: Oil on Canvas Size: 17 x 29 Contact: Sharon Sorrels E-Mail: sorrelssf@usa.net To see more of Sharon's art or to make a purchase, go to www.sharonsorrels.com. 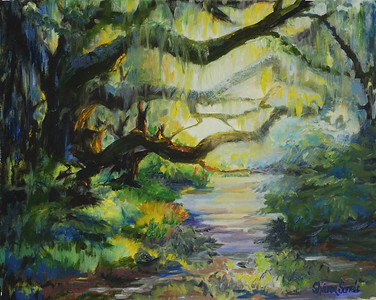 Name: Backlit Oaks Medium: Oil on Canvas Size: 21 1/2 x 25 1/2 Contact: Sharon Sorrels E-Mail: sorrelssf@usa.net To see more of Sharon's art or to make a purchase, go to www.sharonsorrels.com. 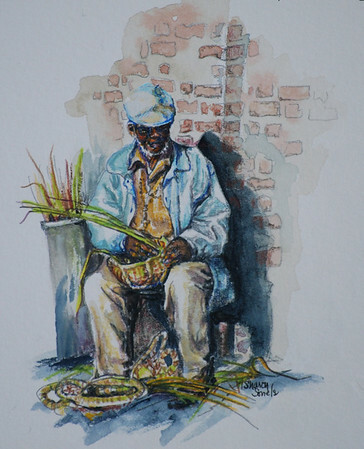 Name: Charleston Artisan (SOLD) Medium: Watercolor and Colored Pencil Size: 14 x 15 Contact: Sharon Sorrels E-Mail: sorrelssf@usa.net To see more of Sharon's art or to make a purchase, go to www.sharonsorrels.com. 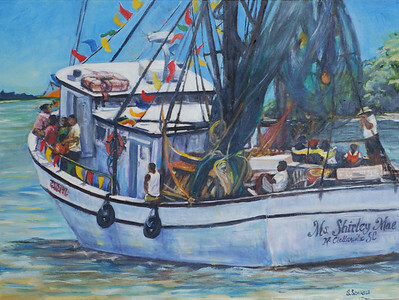 Name: Shrimp Boat - SOLD Medium: Oil on Canvas Size: 36 x 46 Contact: Sharon Sorrels E-Mail: sorrelssf@usa.net To see more of Sharon's art or to make a purchase, go to www.sharonsorrels.com. Name: A September Day Medium: Oil on Canvas Size: 29 1/2 x 41 Contact: Sharon Sorrels E-Mail: sorrelssf@usa.net To see more of Sharon's art or to make a purchase, go to www.sharonsorrels.com. Name: Andrew Rodrigues Medium: Oil on Canvas Size: 28 x 38 Contact: Sharon Sorrels E-Mail: sorrelssf@usa.net To see more of Sharon's art or to make a purchase, go to www.sharonsorrels.com. 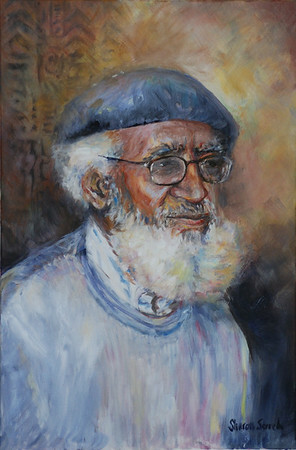 Name: Pearl Fryar Lectures (SOLD) Medium: Watercolor and Colored Pencil Size: 13 3/4 x 16 1/2 Contact: Sharon Sorrels E-Mail: sorrelssf@usa.net To see more of Sharon's art or to make a purchase, go to www.sharonsorrels.com. 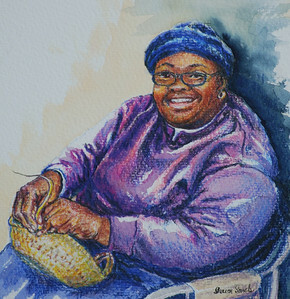 Name: Charleston Artisan with Blue Hat (SOLD) Medium: Watercolor and Colored Pencil Size: 15 x 15 Contact: Sharon Sorrels E-Mail: sorrelssf@usa.net To see more of Sharon's art or to make a purchase, go to www.sharonsorrels.com. 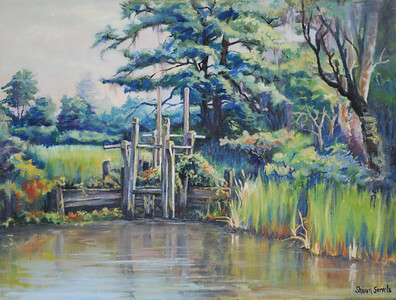 Name: Old Rice Field Sluice Gate Medium: Oil on Canvas Size: Contact: Sharon Sorrels E-Mail: sorrelssf@usa.net To see more of Sharon's art or to make a purchase, go to www.sharonsorrels.com. Name: Girlfriends Medium: Oil on Canvas Size: 23 1/2 x 29 Contact: Sharon Sorrels E-Mail: sorrelssf@usa.net To see more of Sharon's art or to make a purchase, go to www.sharonsorrels.com. 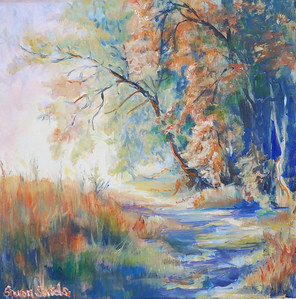 Name: Edge of Woods Medium: Oil on Canvas Size: 15 x 15 Contact: Sharon Sorrels E-Mail: sorrelssf@usa.net To see more of Sharon's art or to make a purchase, go to www.sharonsorrels.com. Name: Betsy Ware Medium: Oilon Canvas Size: 18 1/2 x 15 1/2 Contact: Sharon Sorrels E-Mail: sorrelssf@usa.net To see more of Sharon's art or to make a purchase, go to www.sharonsorrels.com. 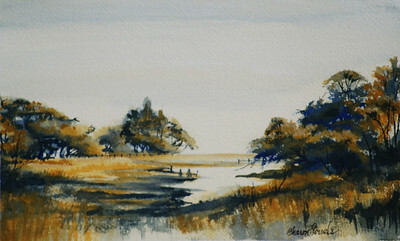 Name: Marsh in Blue and Gold - SOLD Medium: Watercolor Size: 16 1/2 x 12 3/4 Contact: Sharon Sorrels E-Mail: sorrelssf@usa.net To see more of Sharon's art or to make a purchase, go to www.sharonsorrels.com. 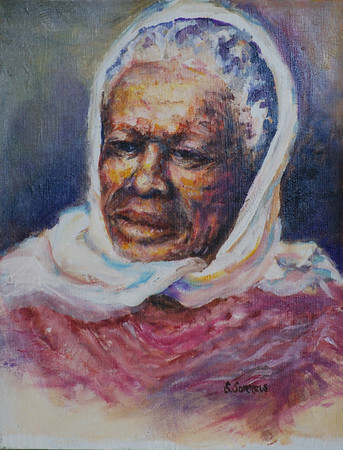 Name: Ms. Shirley Mae Medium: Oil on Canvas Size: 24 x 291/2 Contact: Sharon Sorrels E-Mail: sorrelssf@usa.net To see more of Sharon's art or to make a purchase, go to www.sharonsorrels.com. 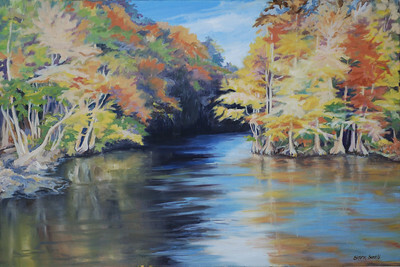 Name: Waccamaw Autumn Medium: Oil on Canvas Size: Contact: Sharon Sorrels E-Mail: sorrelssf@usa.net To see more of Sharon's art or to make a purchase, go to www.sharonsorrels.com. Name: Roadside Garden Medium: Oil on Canvas Size: 17 x 29 Contact: Sharon Sorrels E-Mail: sorrelssf@usa.net To see more of Sharon's art or to make a purchase, go to www.sharonsorrels.com. Name: Rocky Stream Medium: Watercolor Size: 17 3/4 x 21 34 Contact: Sharon Sorrels E-Mail: sorrelssf@usa.net To see more of Sharon's art or to make a purchase, go to www.sharonsorrels.com. Name: Pond Shadows - SOLD Medium: Watercolor Size: 23 1/2 x 15 1/2 Contact: Sharon Sorrels E-Mail: sorrelssf@usa.net To see more of Sharon's art or to make a purchase, go to www.sharonsorrels.com.